Using the Social Selfie Machine from Snaparazzi Photo is like having the best from both the traditional photo booth and the modern selfie. This free-standing digital photography kiosk is not only a worry-free customer magnet for trade shows, brand activations, and everyday places of business, but we customize it with your company’s branding and logos to fit the theme of your current marketing campaign. 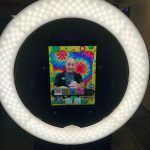 Anyone can snap a selfie with a mobile phone these days, but there’s still something special about using a social media kiosk. The social kiosk encourages groups to gather. Friends pose with friends, co-workers and strangers, drawing attention to your brand activation. 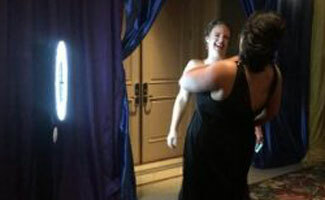 Typically, the biggest downside to the traditional photo booth experience is the lack of digital photo sharing. Fortunately, the Social Selfie Machine addresses all these points and then some. Instant digital photo sharing sends the still photos, GIFs and even boomerang photo clips to your customers’ smartphones via email and text. To enhance your already successful brand activation, we will use your theme to create branded, digital photo frames for the guest’s images. Most guests share these digital photos to more than one social media network, exploding your social media presence! Using Snaparazzi Photo’s picture marketing services is effortless for you. Our pro team will manage all the annoying details of your event. We will provide brand ambassadors to represent your brand at the photo kiosk. We handle delivery, set up, and breakdown. We work with you to customize the Social Selfie Machine’s filters and graphics to reflect your brand’s message. 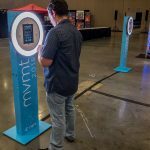 At the actual event, the open-air kiosk may be positioned in such a way that it will show off an appealing view of your venue in each photograph while accommodating large group photos. On the other hand, you may choose to have our tech guys create a digital green screen option that displays a fun, interactive scene which meshes with your marketing campaign. Other options include a custom-made backdrop which integrates with your marketing, a step and repeat backdrop, a solid backdrop, a glittery backdrop, a floral backdrop, a balloon backdrop, or a backdrop provided by you. At Snaparazzi Photo, we have many background options available and our professional staff will help you make the best choice for your event. Include some hashtags in the photo frame linking back to your company’s social media accounts to drive up your brand activation even more. Make your taglines as unique and catchy as possible, and tweet, post and share them on every social media platform from each of your business profiles and pages regularly. Then, sit back and watch your brand take off as your customers share pictures from the Social Selfie Machine showing what a great time they had and using your hashtags. With all its custom features, the Social Selfie Machine creates a fun and memorable experience for all who use it. Capture some carefree smiles at your next big corporate event or keep a kiosk year-round at your place of business to boost your digital marketing presence in an almost effortless way. Call the photo professionals from Snaparazzi Photo to discuss your options today.